Prepare this dip with authentic parmesan cheese from Italy. The flavor that the Italian parmesan cheese has is unique. Grate the parmesan cheese in an easy and fast way with the “Zyliss Grater" – as it is done in the restaurants. Buy the “La Costena Chipotle Peppers" because they are the ones that have the best adobo. The combination of ingredients in this recipe is wonderful . The chipotle pepper is soft, delicate, spicy and smoky. Whereas the famous parmesan cheese is one of the most complex cheeses that there is for its smell and salty and dry flavor. What happens to be very interesting about this fusion of flavors and aromas is that each ingredient maintains its identity , which is wrapped in the softness of the cream. – But that’s not all because the color that is created in this dip is gorgeous ... with the simple fact of seeing it you will want to try it. 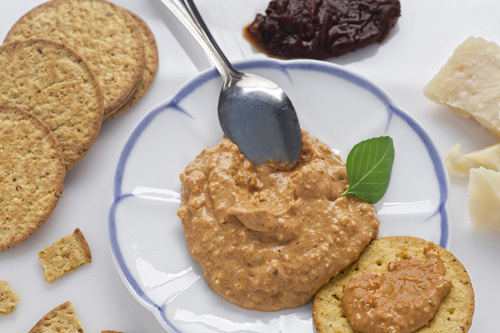 The parmesan cheese chipotle dip can be served with crackers, bread or with some tasty maize tostadas. It is also an excellent accompaniment of almost any pasta or even of almost any variety of fish or grilled seafood. In this recipe you are only going to blend and cook – you really won’t have any problem with the preparation. The chipotle pepper that is used in the dip has to be in adobo, which can be bought canned or if you want to cook more it can be prepared here. It is very important to use white vinegar in this preparation and don’t substitute it for any other type of vinegar, that has a lot of flavor because only a point of sourness is looked for that softens the potency of the parmsean and of the chipotle. This recipe will take you 5 minutes to prepare it. 1/2 cup of Mexican Cream (4.2 fl oz). Pour in a saucepan the mixture that was blended. 1½ cups of Mexican Cream (12.7 fl oz). 1/4 cup of White Vinegar. Mix the parmesan cheese chipotle dip and cook it over medium-low heat for about 3 minutes, until all the ingredients integrate and they thickens a little; stir regularly. While the ingredients cook the dip should not boil so its consistency doesn’t change, just a light cooking is looked for. Did you like the Cheese Chili Dip?